Barbara Lesser (fibers) Top/Blouse. Shoulder seam to shoulder seam 32" (total). Long sleeve. Shoulder to hem 36" long. Shoulder to hem 30" short. Sleeve length 24.5". Hem Width 80" (total). Armpit to armpit 40" (total). Arm length: 23 1/2". Length: 29". Blue Green tie dye. 50% Cotton, 50% Modal. Great condition. Pre-owned top in excellent condition. Barbara Lesser top in lightweight, floaty cotton and silk, slight cap sleeves, hem lower in the back. Labelled machine wash gentle, tumble dry low.I hand washed and line dried. In very nice previously owned condition, needs to be pressed if you're into that kind of thing. Body Hugging Knit with stretch. Ruffles at neck and sleeves. 3/4 Sleeves. Size Small. This blouse is 100 pct cotton knit, the ruffles are rayon chiffon. Armpit to armpit: 20" across. Ruffle Trim along neckline and sleeve openings. 3/4 Sleeves. Length: 23". Armpit to armpit 17.25, front length 25.75. Barbara Lesser Fibers Brown Knit Blouse / Top Balloon Sleeves NWT sz M $94. 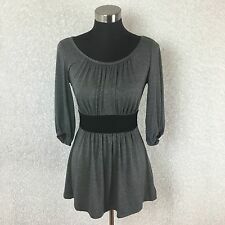 This cute knit top is gathered at the waist in back, the front has a pretty flare, nipping at the waist a little bit and there are pockets with welts. The sleeves are dolman and gathered to a narrow band around the bottom. Black knit modal blend top by Barbara Lesser. V neck with beads around neckline. Any noteworthy defects in condition will be fully detailed with a picture if possible. We strive for 100% Positive experiences! Ladies' blue, gray and white tie-dye top with semi-sheer cupra rayon yoke. Barbara Lesser, Fibers, Romantic Button Front Black Lace Top, Sz. Small, EUC! Gorgeous and Romantic button front black lace top. Collared with notched sides. 2 Buttons at the cuffs. Scalloped hemline and scalloped finifsh at the sleeve. This is perfect for a more formal party or pair with your favorite tank/cami and a pair of jeans for a great look! Barbara Lesser. Solid Blue. Sleeve Length: 0". Unless otherwise stated. We strive to describe our inventory to the best of our knowledge. Ruched Accents To Neckline. Barbara Lesser. Back Neckline to Hem: 26". Sleeve Length: 17". 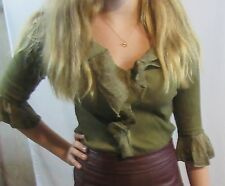 Blouse Shirt. 3/4 Sleeve. Armpit to Armpit: 21". Solid Black. A great jean jacket style shirt with a slightly distressed look. 97% cotton 3% spandex. The jacket/shirt buttons down the front with 6 buttons. Item shows little signs of use or wear. bottom 18". length 25.5". Length (shoulder to hem): 25". This is a very cute Barbara Lesser V Neck blouse, made of cupra rayon, in the USA, with a jeweled neckline, in a size Small, and it's just plain cute. Shoulder to Shoulder 15". Ruffled Neckline and Cuffs. Pink V Neck. WOMEN'S BARBARA LESSER SHORT SLEEVE SHIRT~ SIZE S~ NWT~RETAILS FOR 98.00~NICE!